Usually found with a cuppa tea in hand, would find it almost impossible to go through the day without listening to music and get a buzz from planning my next travel destination and meeting people. I love discussing new enterprising ideas intertwined with relentlessly quoting from The Office and Peep Show. Oh, and I tweet via @JonColen. In the West Midland area, born and raised, near the Black Country is where I spent most of my days. I’ve held all sorts of roles in business, projects & events management, retail management, sports, construction, hospitality and sales. After graduating with a degree in Business & Management, the most unusual job I’ve held has been teaching Sexual Health through the means of Art, Football and English lessons in West Africa. 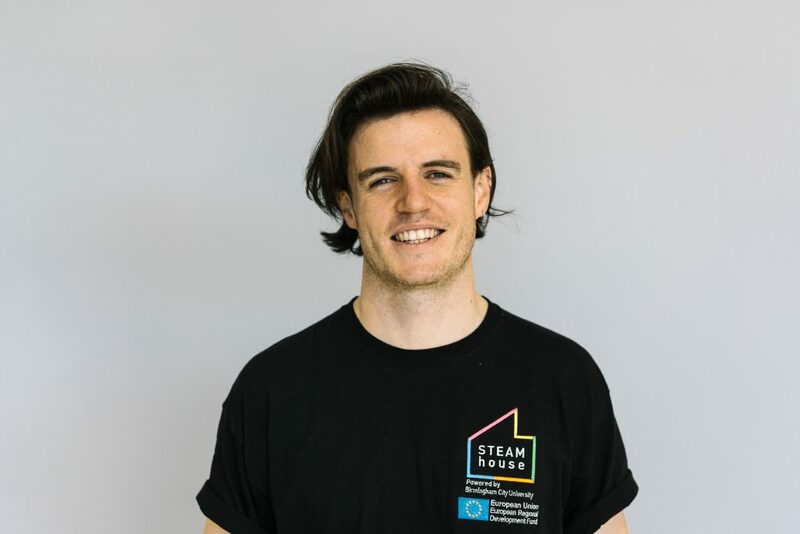 My passion for entrepreneurship and creativity drew me to marketing which I am now proud to have experienced several years developing in and has given me the opportunity to lead on marketing for STEAMhouse. Always keen to learn, particularly around strategic business thinking and keeping my finger on the pulse with the world of marketing. It’s my job to persuade you to come to STEAMhouse events, collaborate with us and sign up to our free programme – luckily for me STEAMhouse is far too good an opportunity to be missed so it speaks for itself. I just need to make sure we are doing it justice and telling interesting stories. Got an interesting idea for a new product, service innovation or collaboration? Find me in STEAMhouse and let’s make it happen! A vision is better than committee, a camel is a horse designed by a committee. However, vision plus collaboration is a different story, collaboration can lead to things your vision may never have imagined before and take it to whole new levels. I think collaboration over competition is society’s best chance of reinventing itself. I want STEAMhouse to take the region by storm by helping creatives and entrepreneurs to create innovative and sustainable businesses which will make people stand up and take notice of Birmingham. To tackle homelessness, an issue which has been getting worse in the UK and our region in recent years. In my opinion we can’t claim to have strong economic growth if we are leaving some of our tribe behind. My guitar and kettle, they’re the first two things I pick up and turn on when I get home. I have eaten tarantulas but I am very uncomfortable around pigeons…don’t they just have the craziest look in their eyes? Easy. Dr. Emmett “Doc” Brown from Back to the Future so he can explain how he created the flux capacitor! I’d stick him in a team with Da Vinci, Branson and Hendrix and what they come up with to put the world to right.